Paul McNaught on the 360 tour. My friend Stevie gave me a cassette recording of Achtung Baby. I took to this album straight away. Even Better Than The Real Thing and Mysterious Ways got me hooked. There’s not many tracks on this album that I don’t like. My big cousin Jim and I saw U2 for the first time in Adelaide, November 16, 1993, on the Zoomerang tour. Of all the U2 gigs you’ve seen, which one would you see again if you had the chance and why? That is a tough question for me, U2 put on such a great show every time. So I’ll answer as follows. I was in the stand for Zoomerang so I’d like to have been in that crowd at the B-stage with the diehards. PopMart I’d love to see again, definitely B-stage again. It’s awesome being at the bottom of the stairs of the mirrorball lemon when they come down to play. Vertigo, again I was in the stand. I’d want to be at one of the B-stages with the fans. 360 I’d like to see the whole show from the stands to get the full claw/screen experience. Have you met any members of U2? If so, can you take us through what that was like? Had the opportunity to meet Bono and The Edge in Adelaide before the Vertigo show. My wife and I arrived at the stadium early with my mission to meet the band or at least a member of the band. We had lunch at the stadium and my wife could see that I was desperate to get out and go find where the band would be entering the stadium. Before going on the hunt, I visited the merchandise stand where I bought a few T-shirts for myself and one for my mate Stevie in Scotland. Every tour we get each other a shirt from a show we attend. From there we made our way around the outside of the stadium to find the band entry point. Finally we found a spot where there were others waiting behind a small wooden fenced area. There was an entrance to the stadium directly opposite, this was the spot. I got talking to a guy who was waiting there, his name was Peter and he was from Belgium and was attending all the Australian shows. He had met the band several times and it was great talking to him while we waited…….and waited……and waited. My wife was doing really well as she is not a fan but she hung in there with me. It was a really sunny day and was quite warm standing there. During our wait we saw Dallas Schoo come out. He had a guitar in a case which he put down next to the fence and opened the case. He came over to the group further up from where we were and was giving out guitar picks. By the time I got up there I missed out on a pick. An American security guard came out at some point and addressed the group. He said it was up to us to behave appropriately if/when any band members stopped when they arrive. If we did not behave well they would either not stop or cut their stop short. I think he may have come out twice. We made sure any new arrivals were told this. After quite a few hours of waiting there was a bit of action at the gate, some security guards came out and there were a few police officers waiting around too. A girl also appeared at the gate and she looked quite official with her security pass showing. I found out later that this was Georgia, a friend from the U2 forum. The police closed off the road access to the right of the gate and stopped people from walking down the road. The crowd waiting was quite big by now and Peter said it was bigger than the Sydney crowd and he was worried the band would not stop. A few cars and four-wheel drives drove in and did not stop. I was disappointed and did not recognise anyone in them. A black 4WD stopped outside the gate and before I knew it, The Edge was heading straight towards us. I was floored and very surprised he was there in front of us so quick. Brian Murphy was his security guard and he told us to be calm and that they would not have time for any photographs as they were late, but would be happy to sign and meet fans. The Edge went to Peter and signed the front of his shirt for him and he worked his way to my left. During all this Bono appeared and the crowd went a bit crazy but everyone stayed behind the small fence. Again he came right to us, started at Peter, signing his shirt and speaking some French with him too. I was in a trance, didn’t even think to speak, I was gone, it was all too much. 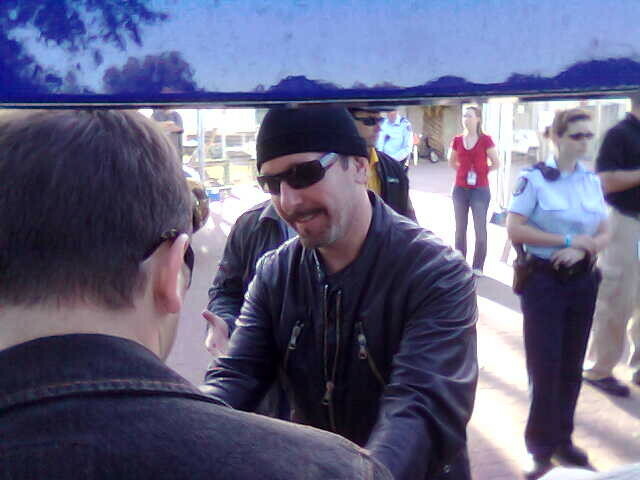 Bono signs autographs in Adelaide, 2006. Once The Edge and Bono had been down the whole line to the left of me they came back around the line to catch the people to my right. I had an A4-sized photo of Bono in his muscle shirt from PopMart that I wanted signed. Brian Murphy took it from me and gave it to Bono to sign. When Bono looked at it he said “you know, this is how I see myself”. We had a laugh and then he signed it for me with his silver sharpie and looked at me over his shades with a grin on his face. I was a very happy man. Bono then walked to the crowd on my right and actually stood for a photo with one lucky fan. Bono said something like “you have to spoil the Germans”. The crowd let out a bit of a groan as they saw this guy get a photo when they didn’t. The Edge appeared in front of me again and he stood there for what seemed like ages. He waited while I went through my bag to find something for him to sign. I had a small promo from All That You Can’t Leave Behind. I only had a black pen but he managed to get his signature on the white part of the black and white flat for me. I shook his hand and thanked him for coming out. I saw Bono do a quick interview for the Channel 7 news right in front of me. Later that night we watched the news and sure enough there we all were. I still have a recording of this. The crowd was starting to get quite large and was pushing in from the road. At this point both Bono and The Edge called it quits and they got back in to their cars and entered the stadium. I was buzzing and we still had the show to see. As a fan, it was an amazing experience for me. I had a camera but only took a few photos. Luckily my wife had the sense to take some shots on her phone camera too and actually got one of The Edge signing for me. Don’t miss another blog post. Follow U2 Australia on Facebook, Twitter and Instagram. We know U2 are working on another album. What are you hoping for? With U2 you never know what to expect. I’ve read that it’s like Achtung Baby, but they have never released an album that sounded like another, in my opinion. I really like Songs Of Innocence, I took to that album very quickly, it’s a great album. (The new album) may be a continuation of that sound/story? Who knows? But I’m very excited to hear Songs Of Experience. 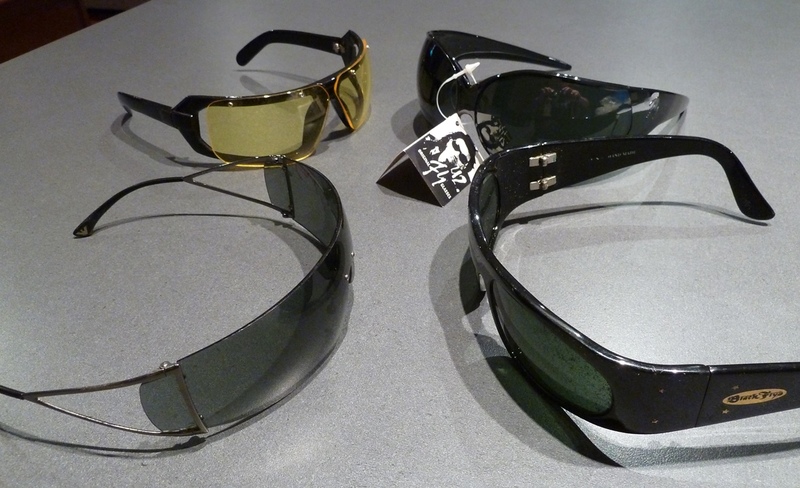 Some of Paul’s Bono shades. Do you have any U2 memorabilia that is special to you? If so, what are the items and why do they mean so much to you? My signed items from when I met Bono and The Edge are quite special to me. I have them framed. I have a pair of original The Fly shades and a pair of the yellow shades from the PopMart tour promo at Walmart. 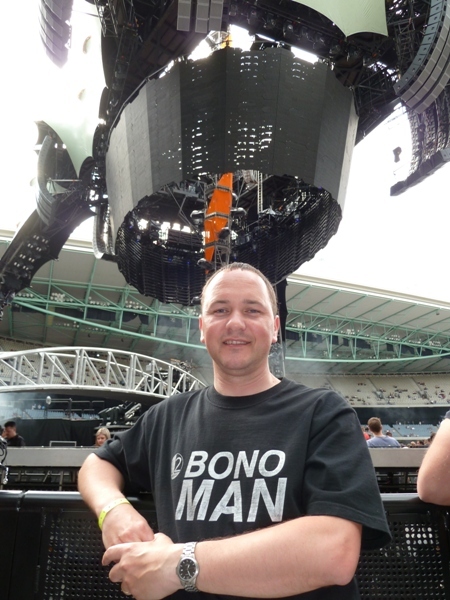 I have a thing for U2 T-shirts and I have many. Out of my work clothes I am rarely seen not wearing a U2 shirt. For a time I collected promo CDs. I have quite a few in my collection. It is a bit sad that we do not get CD singles anymore. The extra tracks and remixes were great. I have all the Propaganda and U2.com fan club gifts, most of these are really nice to own. Do you have a favourite band member? What makes them stand out? Bono and The Edge, I’d say, were my favourite members. They seem to be more accessible to fans and, in my opinion, have been the spokesmen of the band for some time where Larry and Adam prefer to take a back seat in that respect. Larry and Adam are a bit less accessible to fans too. I know they don’t owe us anything but 10 minutes of their time can make a lot of fans, including me, very happy. I can’t say I have one favourite song, there are too many and it depends on my mood. Even Better Than The Real Thing was one of the songs that got me hooked on U2. Again, I don’t have one favourite. Like the songs, it depends on my mood. If I’m pushed, I’d say Achtung Baby.